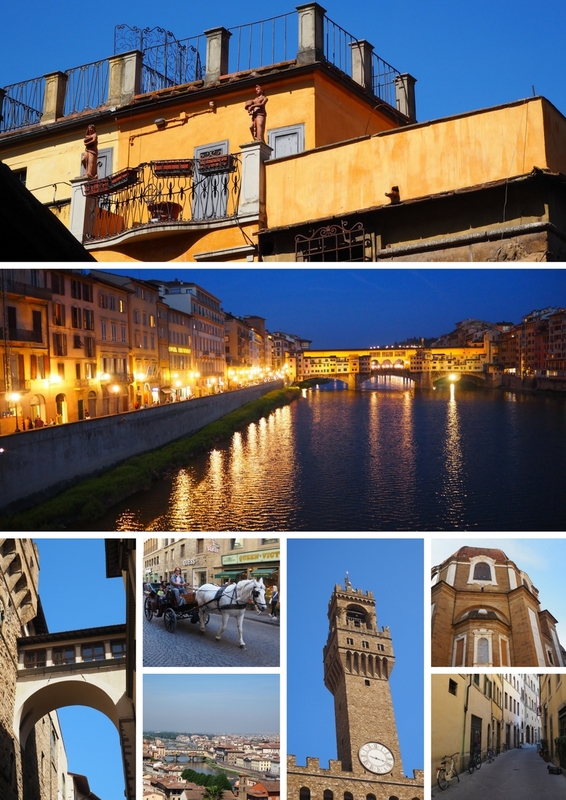 The locals call it Firenze, which is derived from the latin word for “blooming”, a beautiful meaning. Curious whether or not it lives up to the hype, my girlfriend and I decided to visit Florence at the end of April 2018. If you‘re looking for the quick answer – yes, we loved it! But if you’re looking for pictures and impressions, keep reading. Florence is known as the “cradle of the Renaissance” not for its art galleries, but for its churches, monuments and buildings. The city delights at every chance. All buildings are hundreds of years old and seem stuck in time. Narrow streets join large piazzas in a maze that never ends. Architectural symmetry is everywhere. The river Arno passes through the city and is crossed by one of the most picturesque bridges I have seen in Europe – Ponte Vecchio. It’s a beautiful landmark, great for pictures during the day, but even better at night, when the lights throw a nice reflection. The best way to experience Florence is to just wander around, visit the touristy squares, but also explore the small side streets. We did just that for three days, and for brief moments we felt like we were taken back hundreds of years to the age of the Renaissance artists. The best panoramic view of Florence can be seen from Piazzale Michelangelo. As the name suggests, the piazza at the top of this hill exhibits several bronze copies of Michelangelo, including the famous sculpture of David. We went there in late afternoon and waited eagerly for the orange colours of the Tuscan sunset. For the keen explorers out there, we recommend walking around the city either before 10:30am or after 6:30pm. As one can imagine, Florence is a very popular tourist destination and early morning or late afternoon are less busy and ideal for photography. 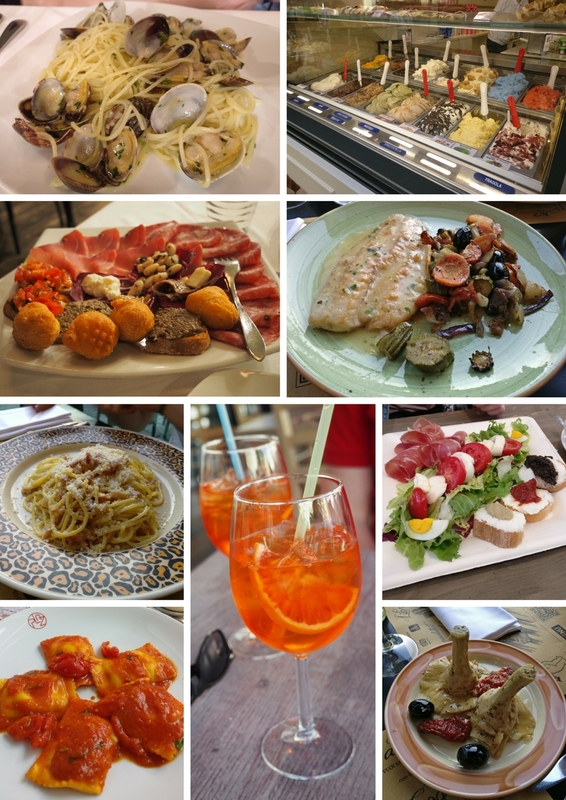 Florence food is delicious! We tried both touristy restaurants and small taverns. Every single time we left the venue with our bellies full and with smiles on our faces. Italians are very proud about their cuisine, so most places offer a great variety of pizza and pasta dishes. If you want something lighter, try a salad with tomato and mozzarella – simple, but tasty. To round things up, do yourself a favour and have some freshly made ice-cream in one of the many gelato shops around the city. Here are a few of our favourite places. La Ménagére is a nice bistro, great choice for breakfast. Osteria Pepò is small, welcoming and great for dinner. Trattoria di Giorgio has a nice offer of 2 dishes, wine and water for €15. Lastly, but not least, all pizzerias make nice pizza for €7 to €10. 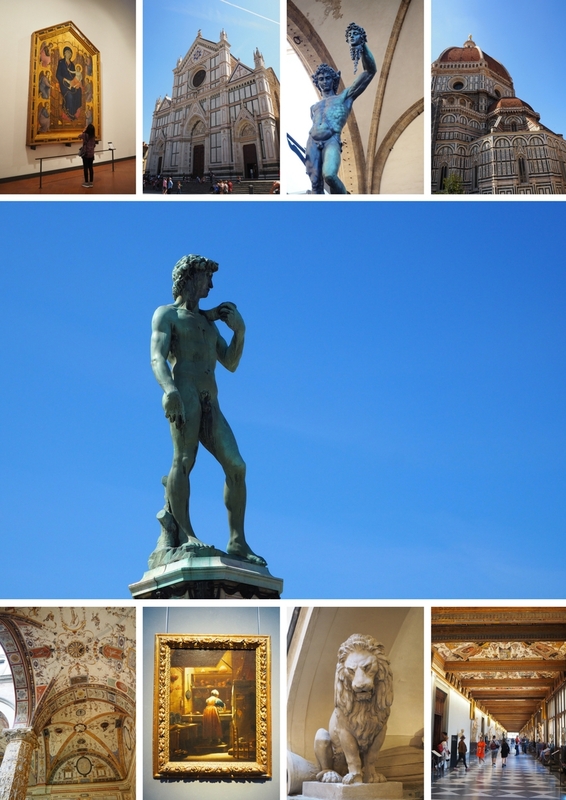 Florence has plenty to offer to art lovers. The various museums and galleries around the city centre are home to statues and paintings by the likes of Raphael, Titian and Michelangelo. Working with a limited budget and wanting to avoid the lengthy queues, we only went to one gallery, but well give you an idea of what to expect based on the very useful Florence booklet we had with us. We pre-booked tickets for an afternoon in the Uffizi Gallery, one of the main Italian art museums. There are numerous Renaissance masterpieces, including Botticelli’s Birth of Venus and several works by Leonardo da Vinci and Raphael. The gallery has two levels and takes 2-3 hours to visit. Pre-booking is a good idea, otherwise you might be stuck in a looooong queue. The Duomo (officially, the “Cathedral of Saint Mary of the Flower”) is the main cathedral of Florence. It’s a massive construction, over 600 years old and now decorated with a neo-Gothic facade. The cupola is an architectural masterpiece and the Duomo complex includes a museum that tells its story. Those who love sculptures should not miss the Museo del Bargello, hosted in one of the oldest buildings in Florence, dating back to 1255. The famous (and original!) David by Michelangelo is, however, hosted in the Galleria dell’Accademia, with replicas in Piazza della Signoria and at the top of Piazzale Michelangelo. I’m sure there’s more to say about Florence and even more to do while you are there. Before I give my final recommendation, I thought I should share a few practical tips. If you don’t speak Italian, don’t worry. You’ll get away with speaking English just fine. Late April seemed a good time to visit Florence. The temperatures were 21-28°C every single day. I suspect it gets much hotter in the summer months, so I would avoid visiting then. Although we didn’t do any shopping, the city has plenty to offer. There are numerous outlets, from high-street ones, to small shops for food, leather jackets, shoes, bags, you name it. Lastly, don’t drive into Florence. The city centre is pretty much a pedestrian only area, with a few electric taxis here and there. You really don’t need a car as the central area is small enough to walk. 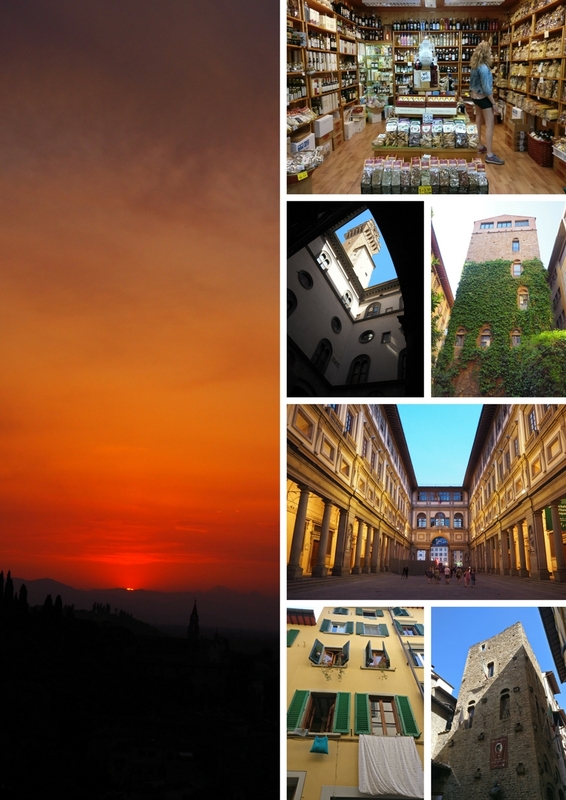 Florence is indeed the “cradle of the Renaissance”, with its old buildings, monuments, churches and art galleries. The city delights at every chance and I wholeheartedly recommend visiting Florence. In a separate entry, I wrote about my experience of Siena and Pisa, two other old and important Tuscan cities.